After a busy couple of weeks, I think things should slow down a bit now. Of course, that rarely happens. Just the lull between the storms generally. They’ve also recently started to greet me on the airplane, by name. After takeoff, the flight’s purser (boss of the flight attendants) usually comes around and introduces themselves, asking if there is anything they can do, bla bla bla. It costs them nothing, but it’s a really nice gesture. Sometimes the flight attendant in my section even remembers my name and uses it during the entire flight. It really does make you feel like a celebrity. The people around you definitely pay attention. Should they know you? Are you famous? Hmmm…. On my flight to Montreal, they upped their game one more notch: They brought me a gift. 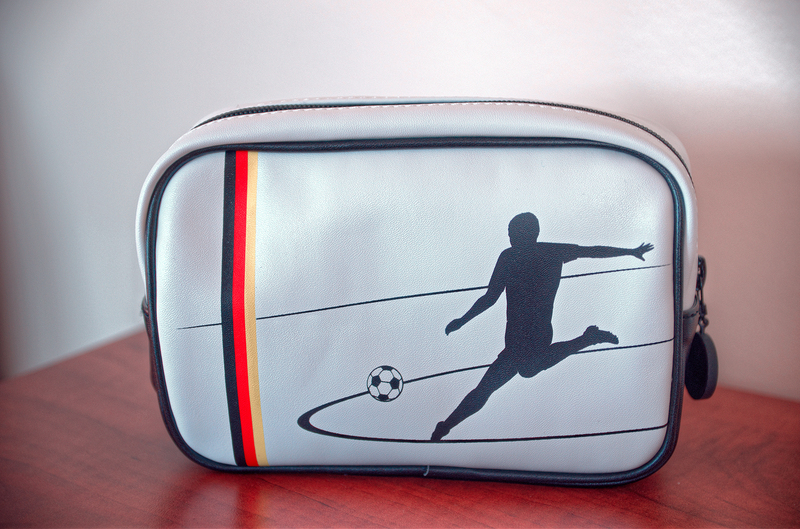 A limited edition World Cup travel bag with an assortment of toiletries inside. Perfect! As well I had an empty seat beside me. Sitting in a bulkhead seat, I had quite a bit of space. Now if only that idiot behind me would stop punching the touchscreen, I might have even slept a bit. On my return flight, I was anxious to see if they’d repeat the gift-giving. The bag is quite nice, but surely can’t cost them very much when they’re buying in bulk. This flight was crowded. Completely sold out. I again had gotten a bulkhead seat (advantages to selecting your seat early). The gentleman seated beside me though had firmly planted his feet against the wall as soon as he sat down, as well as grabbing the centre armrest. Naturally, he was asleep before takeoff. I guessed that this flight I’d be trapped in my seat for the whole flight, with less than the usual ‘personal space’. Great. Just great! But I was wrong. When the purser arrived for their usual welcome speech, I got two surprises. One, no gift. I was a bit bummed that they had arrived empty-handed. Two, at the end of the little speech, they asked “Would you like to sit in Business Class today?” Does a duck like water?? Heck yes!! “Follow me” she said. To the ends of the Earth, I thought. Lead the way!! My seatmate had been woken up by our little conversation, you should have seen the look on his face as I began gathering up my things. Eyes bulging out, mouth open. I could have laughed out loud. In the past 15 months, I’ve flown 196,000 km. Since all my work will buy is economy class tickets, that means I’ve spent 11 DAYS 3 hrs 50 min stuffed into the ‘back of the bus’. Given the chance to sit up front and relax with some space, you’d better believe I’m gonna do it. And no be shy about it. Oh and what was waiting for me in the business class seat: Another gift bag. GOOOOOAAAALLLLL.